Shimansky is one of the most sough-after jewellery companies in the world. For many years, Shimansky has been capturing the beauty of a diamond and creating unforgettable jewellery that speaks to one’s heart. But where did the journey of the luxury jewellery brand all began? The story of Shimansky started in 1991 with a passionate and dedicated man called, Yair Shimansky. The fascinating tale is punctuated with international travel, dazzling diamonds, and a love story, all of which have polished the South Africa jeweller, Shimansky into who he is today. After developing a passion for the diamond industry during a period spent in Japan, Shimansky began his journey with the jewel-studded lands of South Africa, renowned for its platinum, gold and diamond supply. Here, he ventured into handcrafted jewellery trading, a business that flourished. CEO and Founder, Shimansky started retailing jewellery at a beachfront flea market, a few months later he opened a small outlet in a popular shopping mall. Before he knew it, within two years Shimansky opened his very first jewellery store, which was one of the biggest milestones in his career. The bond between South Africa and Shimansky’s work became inextricably tied when the Cape Town jeweller met his future wife, who would bond him with the country in a whole new way. This event perfectly rounded out the company’s origin story, nestling a tale of personal romance at its heart. Over the years, Shimansky acquired an eye for carefully selecting the finest diamonds, and became a skilled artisan, developing many signature diamond cuts that are now patented worldwide. Shimansky’s insatiable pursuit of perfection, combined with his ability to recognise the innate character of a diamond in its nuances, fuels his finest designer jewellery creations and sought-after diamond engagement rings. 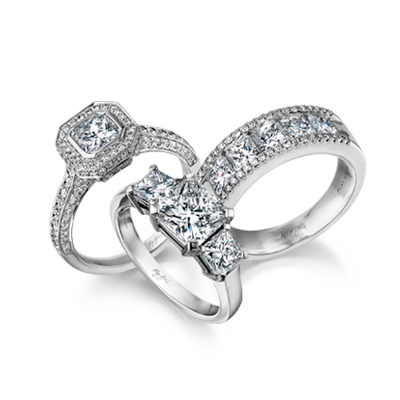 The My Girl and Brilliant 10 diamonds; the Millennium, Evolym and Two Hearts rings: this captures Shimansky’s spirit of love and elegance. To ensure the quality of the diamonds Shimansky hand-selects them directly from the Kimberley and the West Coast regions of South Africa. Today, Shimansky boutiques adorn many South African metropoles. The flagship store at the Clock Tower Waterfront in Cape Town illuminates the journey of the diamond, with a jewellery design and manufacturing workshop and diamond cutting and polishing factory in full view; during an exclusive Shimansky Experience Diamond tour you will be able to witness how a rough diamond is being transformed into a remarkable jewellery creation. The one of a kind feature is unique amongst jewellers and is created to have a hands-on approach while assuring quality jewellery items. The Shimansky Diamond Cutting and Polishing Workshop is accompanied by the Cape Town Diamond Museum, which is devoted to the history of diamonds in South Africa and illustrates the close relationship the Cape Town jeweller has with his adopted country. The tour offers an exclusive insight into the world of diamonds like you’ve never seen it before. Explore the history of a diamond, while viewing remarkable replicas of some of the world’s most famous diamonds. For an experience like no other, make sure to book a Shimansky Diamond Experience Tour, as no visit to Cape Town is complete without it. It has been almost a quarter of a century since Shimansky began his endeavour. The South Africa jeweller has become one of the most recognised and respected luxury design brand. Attention to detail and the passion of one man has made Shimansky the powerful purveyor of some of the world’s most elegant and sophisticated jewellery. There’s no denying the brand Shimansky has come a long way. For more information on the spectacular journey of the Shimansky jewellery store in Cape Town get in touch with one of our diamond consultants at 021 421 2788 or email us on enquiries@shimansky.co.za.